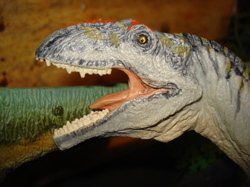 The Giganotosaurus was bigger then Tyrannosaurus Rex. Good Luck. 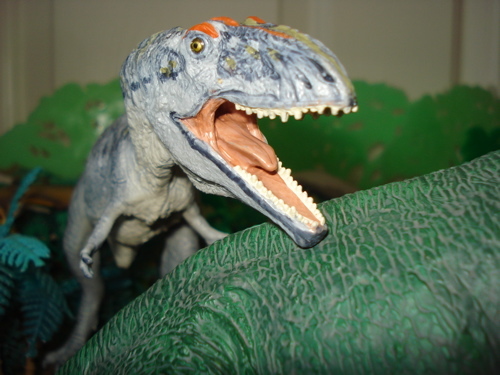 Sometimes a toy, in this case a Dinosaur Toy, comes along that is just so arresting in every way that you fall in love. Move to a small South Seas Island and fawn over it for the rest of your life. Ouch! and then in the contemporary (2007) Diplodocus. 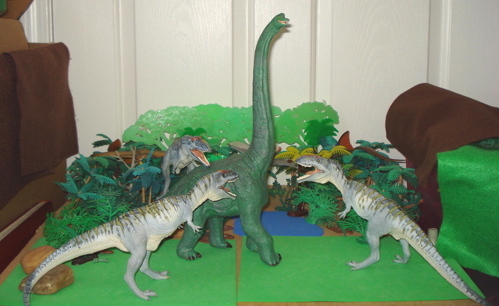 The new Giganotosaurus fit right in with the new regime, and even more so, it led the large Theropod charge. 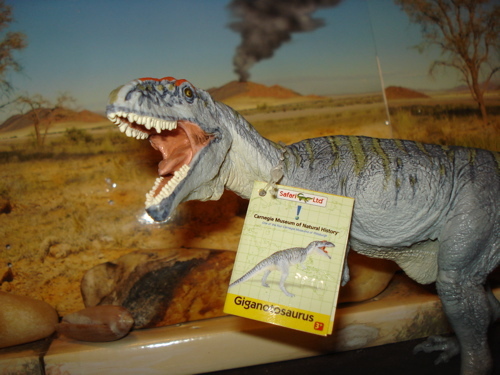 This large fourteen and a half inch (14.5 inches, 35.5 cms) long, nine ounce (9 oz, 252 gms) Giganotosaurus is brightly colored in a basic light blue (UCLA or Carolina Blue) with olive striping and a cream colored belly. While cast in what is a three point (two feet and the tail) stance it is so well balanced that with the judicious use of hot water it can easily stand on its own two feet. "I'm busy stalking a mouse." 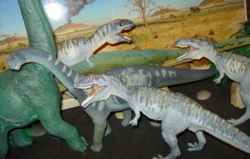 In fact in the Wikipedia Carnegie Collection entry (opens new window) states, in the Miscellaneous facts section: "Some 4122-01 Giganotosaurus are posed in a 'tripod' posture with their tail touching the ground to enable them to stand; while others have their legs posed slightly differently allowing them to stand without their tail touching the ground." According to Safari Ltd this is not, in fact, true. All are cast in a three point stance. Any can be easily remodeled. 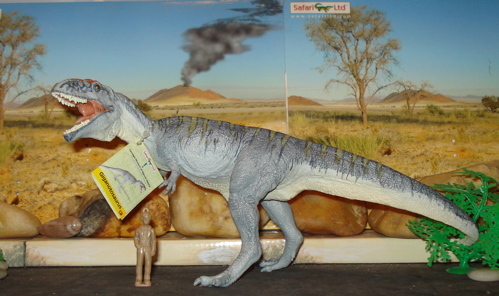 The Carnegie Giganotosaurus comes with a small information pamphlet around its neck. 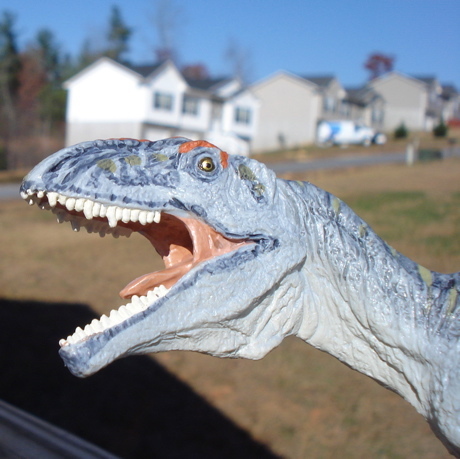 "Buy your own Giganotosaurus and read all about me." which you may want to mess around with. I wanted to lessen the curve in the neck of one my Giganotosaurs and so I did. He was made a patient in my plastorthopedic program. "Now I'm ready for some coffee." 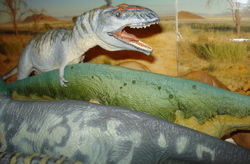 You can see below that the angle of the neck and head in the Giganotosaur at the bottom of the photo has been significantly reduced. 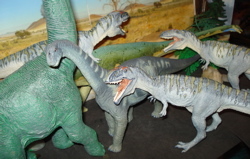 These are Dinosaur Toys and they can be played with in any way you wish. 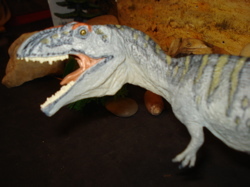 The Giganotosaurus lived in what is now South America. Like so many giant predators (~48 feet, 8-13 tons, the biggest head of any Theropod) it apparently arose in response to the existence of giant prey animals. 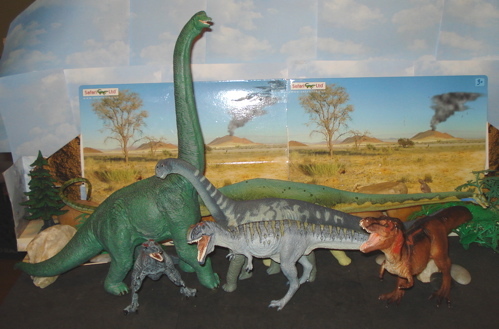 In this case the Argentinosaurus (opens new window) which grew up to 115 feet (35 meters) and 110 tons (100,000 kgs). That is about as big as a Dinosaur got. The biggest we know of at any rate. A Sauropod, it would have lived in herds and been too large for a lone Giganotosaurus. Probably, in a herd, too large for an entire pack of them. 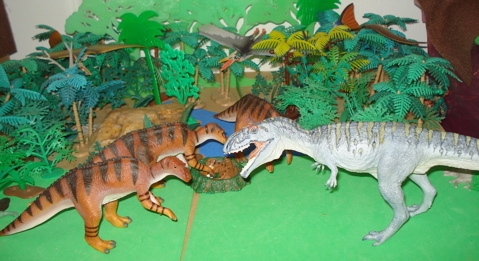 But young, aged or unlucky and the Gigantosaurus would have had a real shot. 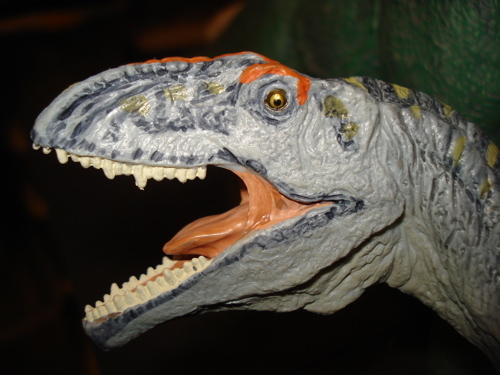 The teeth of the Giganotosaurus were, on the whole, smaller than that of the T-Rex (although the whole Ginanotosaur was larger than the whole Tyrannosaurus) and the teeth more designed for slashing. 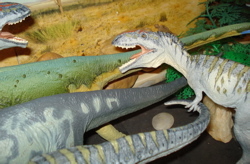 This might indicate that huge, agile Giganotosaurs would charge in and take slashing bites out of the huger Argentinosaurus, eventually weakening its prey which died from exhaustion, bleeding out over time. 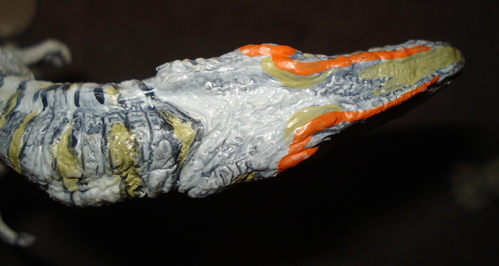 Above (and further above) we see the beautifully colored and detailed head and mouth of this figure. I am absolutely taken with this. I have four of these (thank you Safari Ltd (opens new window) for your generous contributions to the site) and each, as you will see, is slightly different from each of the others. This both supports the boast that each is hand-painted (it's not bragging if its true) but means that yours is an absolutely unique individual. Pretty cool. Head-on these are quite interesting to look at. Great tongue. 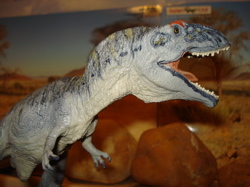 ...today's Carnegie Giganotosaurus has a much wider variety of potential prey than did the old Cretaceous version. And a somewhat safer choice as well. In order to properly proceed with a successful hunt the Carnegie Giganotosaurus requires a body, legs and arms (as well as tail) to get that rather magnificent head to the feast. Let's take a look at the body's overall figure first. The arms can be seen to the left and below. 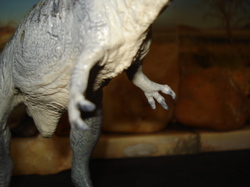 They are nicely sculpted and detailed with clearly defined claws on the ends of the three-fingered hands. 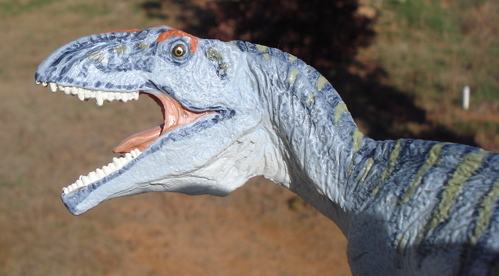 These are an evolutionary improvement over the club-like forepaws of earlier Carnegie Theropods like the Allosaurus, Spinosaurus and T-Rex. and end in highly defined feet, which is always a nice touch for a leg. 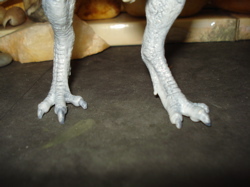 The feet are highly detailed both on top, where it is obvious and on the bottom, where it is not. This a revolutionary improvement. 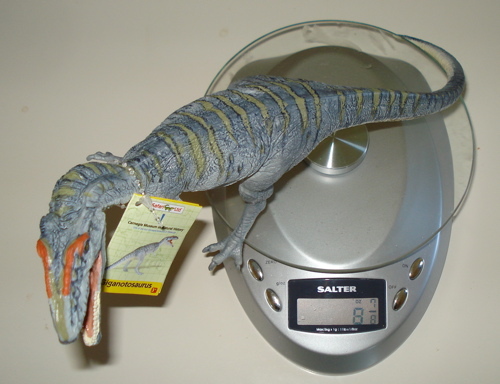 You may also notice a four digit number corresponding to the month and year that your Giganotosaurus came into existence. This is a new innovation brought to you as a result of the insistence of the United States federal government. "Don't try this at home kids. Or alone, either. 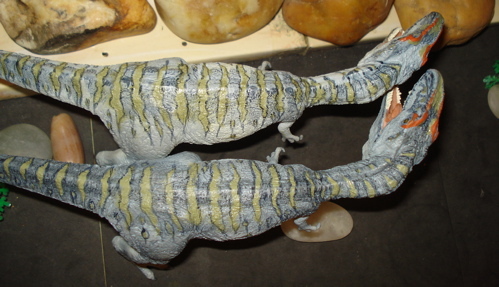 Always bring a friend ot two when you tackle a Brachiosaur." 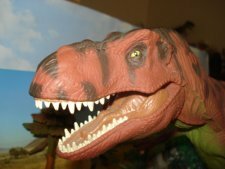 One thing that the Carnegie Giganotosaurus does not need to be concerned about, though, is anybody outdoing it in the colorful-carnivore category. 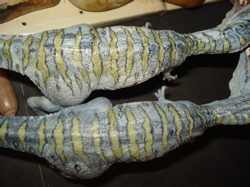 The body of the figure is brightly painted in that good-looking reptilian light-blue with most attractive olive green Tiger-striping outlined in navy-blue running down its back. The detail of the musculature is also very well done making for a very comely carnivore. "I'm so good looking I have two 'best' sides." 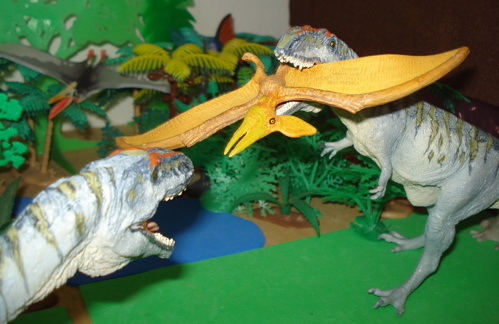 The Pteranodon's view shows a lean, mean (toy) eating machine. "I sure hope he liked the view." The highly detailed underbelly also provides a good view for shorter admirers. 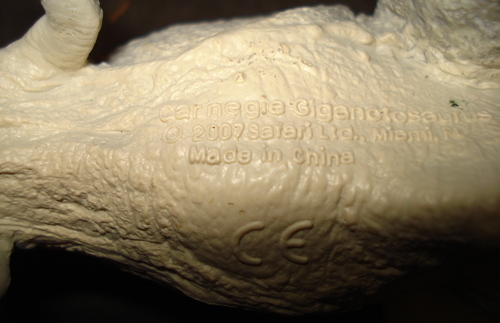 The Manufacturers imprint shows the name of the manufacturer, place of same and other relevant information. 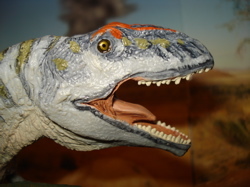 Such as passing the EU's stringent safety standards (CE), the Giganotosaurus' name and pedigree. 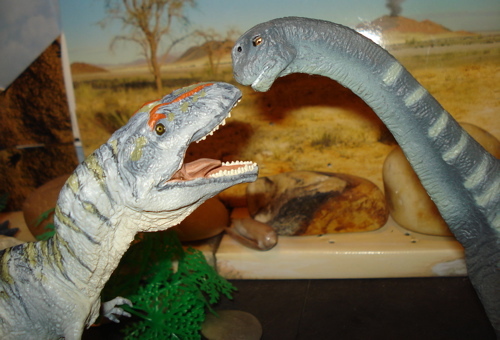 This figure goes very well with the 2006 Carnegie Diplodocus as both are quite colorful characters. 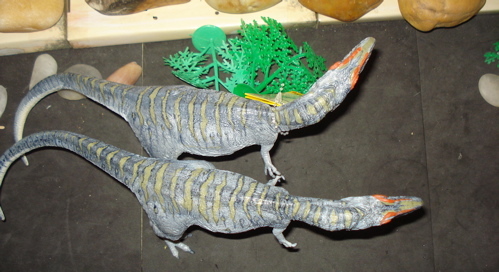 One very nice aspect of these being hand-painted (I can hardly imagine that each and every Dinosaur figure is actually hand-painted by a human being somewhere in the bowels of China. One after another, coming off an unimaginable assembly line is each figure completely rendered by one individual artiste or is it base by column A, stripes by column B, teeth by C and so on down the line?) is that each comes out pretty much as an individual, showing variation in color-shading and detail from one to the next. Just like real life. Sorta. Even the rather monochromatic bellies vary, one to the next. 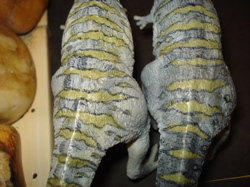 Below you can see the difference in the curve of the neck. 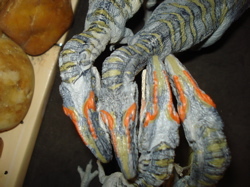 The upper figure was seen earlier in the hot water bath and the lower one is how they come off the line. And once again you can see the difference in coloration. "So, I hear you had a hot meal last night. Anybody I knew?" 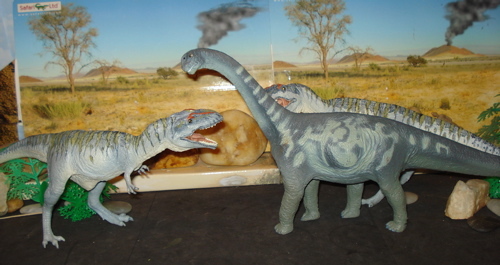 The Carnegie Camarasaurus was a rather popular late Jurassic meal. While it may not have been available to our pale-blue-buddies then, it is now. "I had been hoping to share a salad and a fern entree." 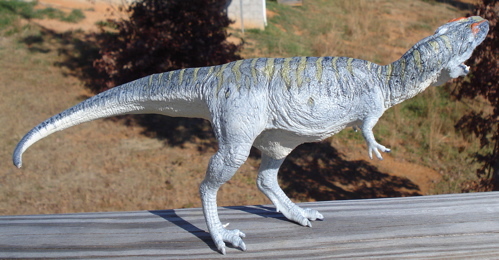 The sculpting on this figure, along with the painting of it, make it my favorite of all the Carnegie Theropod Dinosaurs. 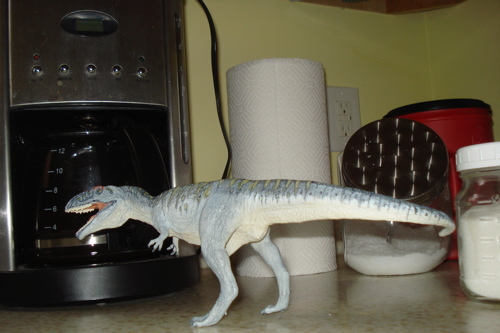 (Of course their 2008 Spinosaurus is right up there as is the 2010 Cryolophosaurus.) 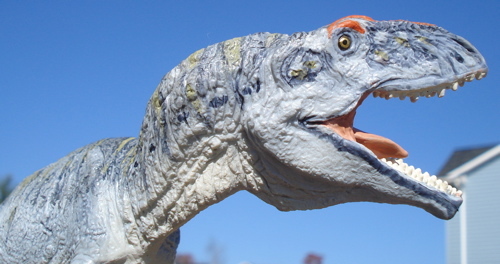 For pure size, colorfulness and detail this Giganotosaurus really leads the pack. But it is the head that really garners my attention. So let's turn our eye onto the head of this rubber Dinosaur. 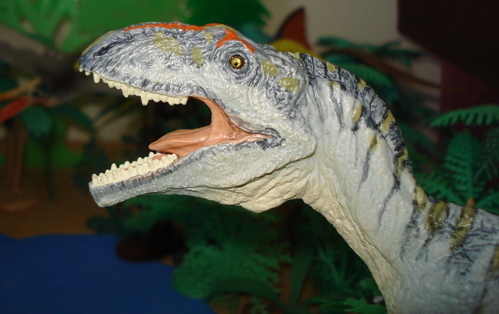 Now over there to the right is the eye of this Tiger-striped Theropod. It really seems to have a depth to it that belies simple paint from an exotic (and polluted) land. 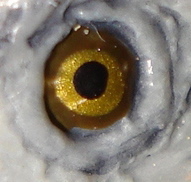 The detailing around and about the eye is typical of the entire sculpture. 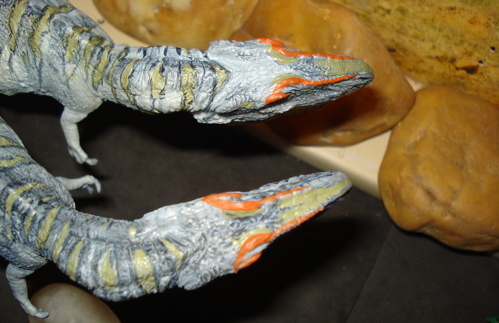 And the head itself is probably the most detailed aspect of the entire figure. Further it shows off the differences, in a sort of microcosm, that make each one unique from the rest on their own macrocosmic fashion. 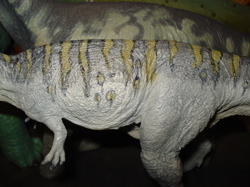 Thew following four shots are details of the upper part of the left side of four different heads, showing the differing detail in the coloration and markings. I had a question about the buildings in the background of some of the pictures so I asked one of the Giganotosaurus about what they were. "Those? They're for food storage." 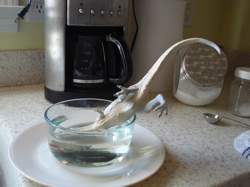 but nothing combines ediblity and exercise as does the ever popular entree, the Carnegie Parasaurolophus. "We got some runners, Frank!" "First give us your money, lunch." "I don't even have pockets." 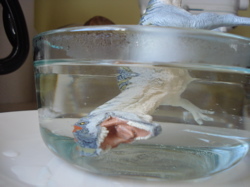 As I am sure you have figured out, just in case I haven't been real clear about it, this is one of my very favorite carnivorous Dinosaur toys. 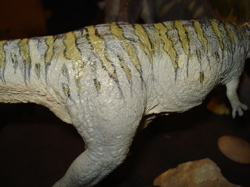 It combines a dynamic (and alterable) pose with excellent balance (allowing it to be posed without the tail for support), exquisite detail and bright coloring. It is part of The Carnegie Collection and emblematic of the new, more detailed and highly (I hate using this word) realistic direction that their manufacturer Safari Ltd has been taking them over the past several years. 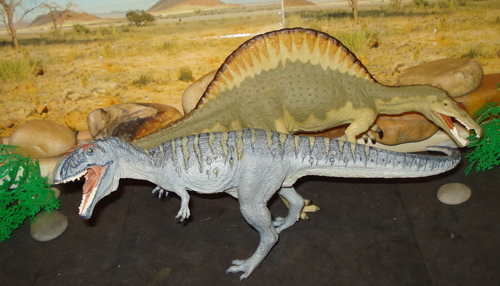 Since it is still in production it can be found both online (opens new window) and at your better retail toy stores. Prices range from ~$17.00 down to $14.00 or so. Never forget to take into consideration taxes and shipping too. As for toxicity and teethe-ability (must be considered with Dino-Babe and Dino-Tot around) this is utterly non-toxic but does have rather hard, pointy parts that make it a questionable playmate for little ones. It has passed all the chemical tests though so if one does take a nip it will come out all right in the end. It is far to soon to determine or declare collectibility (such as with the MARX Dinosaur figures) but it certainly has a rightful place in any body's collection or any child's (or adukt's) toy box.